Our October Calendar Shot comprised of pictures that Sophie and I chose! It is our first attempt at a montage of photos put together for your enjoyment…I’m not sure we did a very good job arranging them, but the photos themselves we love! Thanks for stopping by, now go check out the rest of the entries, and as always, thank you for stopping by and thank you Deb from Focused on the Magic for hosting this for us! Thanks, Suz! Sophie and I picked out the photos, I love the one of her in the pirate garb. We went to Downtown Disney in 2010 when it was her birthday, and the water taxi captain pulled out the kit and gave it to her for her birthday! It was such a great Disney moment and memory! What a great collection of photos!! I love October!! Mike its great! So many fun things in October. Love the ghost! Thanks Julie! The ghost was created by the guy holding it. We were checking out of Pop Century, and getting ready to head home, when we saw this really cool car — as we were admiring it, the owners came out and he showed us his mask for the Halloween Party. Love the fall in the parks and you got some great shots! Beautiful collection and beautiful smiles. Nothing like that Disney grin, is there? Great collage Mike! I love your collection of October memories! Sophie looks adorable!! Love the photos, Mike! 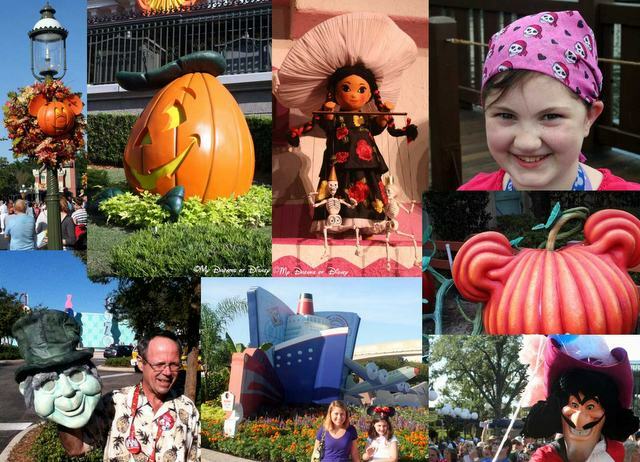 You definitely captured the month of October in pictures…makes me sad, though, that I won’t be able to visit this year for all the fun Halloween activities. I’m hoping to be there next year! I think the collage turned out great! Love the shot of Captain Hook! nice collection of photos there! Previous Post: Happy Birthday Epcot!